To lose one pound each week, you must consume 500 fewer calories than your body burns each day, says the American Council on Exercise, or ACE. While aerobic exercise and strength training can help boost the calorie-burning potential of your body, changing your diet can have a dramatic effect on weight loss. Korean cuisine, rich in low-fat vegetables, seafood, tofu and grains, can help you achieve your weight loss goals. Always talk to your doctor before beginning a weight-loss program. Start with noodle-less soups containing seafood or tofu, but watch out for the chunks of pork belly often floating in the dish for added flavor. Skip the noodle dishes, like spicy cold noodles or rice noodles, because they are calorie-dense and contain processed simple carbohydrates. Instead, order or prepare brown rice as your carbohydrate. Eat short ribs, chicken or seafood at the Korean barbecue restaurants instead of the popular and fatty pork belly called samgyeopsal. Skip the side sauces, which are often loaded with sugar. Fill up on the plentiful side dishes served with most traditional Korean meals. Many consist of pickled or fermented vegetables low in both fat and calories. ACE recommends eating a wide variety of vegetables and fruits for weight loss. Sample kimchi, or spicy fermented cabbage, with your Korean meals. In addition to a high content of vitamins A, B and C, kimchi is virtually fat-free and loaded with fiber to keep you feeling full longer. According to Health.com, eating kimchi can aid digestion and may prevent yeast infections or the growth of cancer cells. Drink green tea instead of beer or soju, a common and cheap Korean alcohol. Most Korean restaurants serve complimentary green tea, and the chemicals in green tea leaves may help to elevate your metabolism and burn fat, according to the University of Maryland Medical Center. 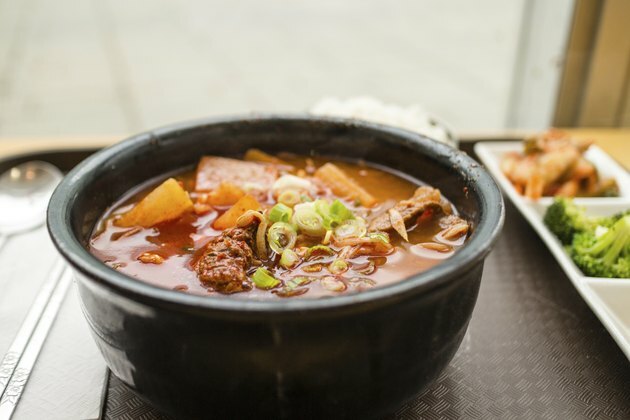 Korean food is traditionally served family style, so one order may represent more than one serving.